A Great LED Key Light that is bright. Features five bright L.E.D. 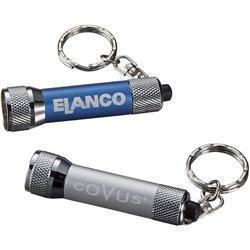 lights (with 5,000 hours of life), keychain, and rubber on/off button. Four button cell batteries included. 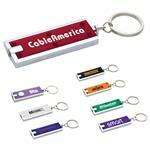 A great tradeshow giveaway with rush production. Dimensions: H 2.5" x W 0.69" x L 0.69"
Typical Imprint Area(s): L 1.15" x H 0.25"
Available Imprint Options: Screen Print or Laser Engrave. Materials: Aluminum. LED Key Light. Key Chain. Carton size H 8.46" x W 7.86" x L 15.73"
Carton pack 400 pieces, Carton weight 22.7 lbs.